NORTH ADAMS (58) — J.Hesler 5 (1) 2-6 15, C.Young 3 (0) 2-5 8, C.Rothwell 4 (0) 3-4 11, S.Meade 1 (0) 0-0 2, E.Young 1 (0) 4-4 6, C.Meade 2 (0) 1-1 5, A.McCormick 5 (0) 1-2 11. TOTALS: 21 (1) 13-22 58. LYNCHBURG-CLAY (42) — A.Cumberland 0 (0) 2-4 2, N.Miller 2 (3) 2-2 15, B.Marcelino 2 (0) 0-0 4, R.Conner 6 (1) 0-3 15, D.Giordano 1 (0) 2-2 4, B.Minton 1 (0) 0-0 2. TOTALS: 12 (4) 6-11 42. SEAMAN – The Lynchburg-Clay Mustangs lost to the host North Adams Green Devils Friday, Feb. 8 by a score of 58-42. Noah Miller and Raymond Conner led the Mustangs with 15 points apiece. The Green Devils were led by Jayden Hesler with 15 points and Cody Rothwell and Austin McCormick with 11 points each. Cameron Young led the Green Devils with 10 rebounds. Lynchburg-Clay opened the game with a four-point run against the Green Devils. 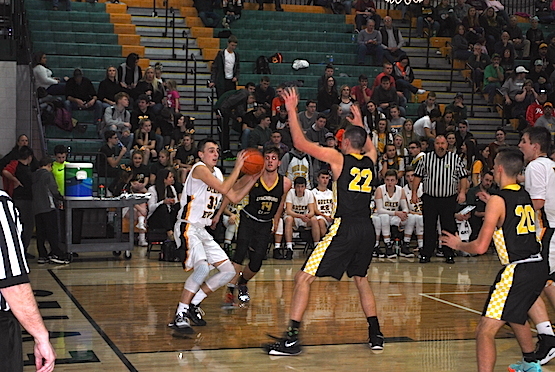 North Adams responded with a six-point run of their own with baskets by Young, McCormick and Hesler. Cade Meade and Rothwell also scored in the first for the Green Devils with five and four points, respectively. David Giordano led the Mustangs after the first period with four points. The Green Devils continued to pull away from the Mustangs, extending their lead from the first quarter. 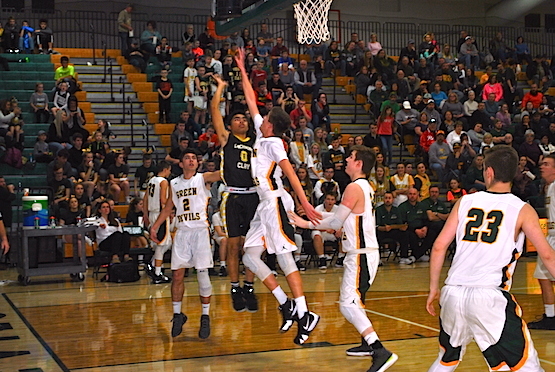 Hesler, Young, McCormick and Rothwell each scored four points in the second quarter for the Green Devils, and two points were scored from the free-throw line by Elijah Young. Cameron Young had nine rebounds in the first half for Coach Nathan Copas’ Green Devils. Conner led the Mustangs in points in the second, nailing a 3-point basket. Two points were scored by Miller, Brady Minton and Blake Marcelino each. Minton scored his two points after stealing the ball from the Green Devils, as did Marcelino on the subsequent possession. The Mustangs came out of the half to begin the third quarter, going on a 6-1 run in the first three minutes. Conner scored six points and pulled down three rebounds in the quarter. Miller scored five of his 15 in the third, including a 3-point basket. Andrew Cumberland came in off the bench and made a free-throw for one of his two points on the night. The Green Devils’ offense would not be slowed down, though. McCormick scored five points, Hesler four points, and two were scored by Young and Seth Meade each in the third quarter. The quarter ended with the Green Devils holding their largest lead of the night at 17 points. The Green Devils’ offense continued to put pressure on the Mustangs’ defense in the fourth quarter. 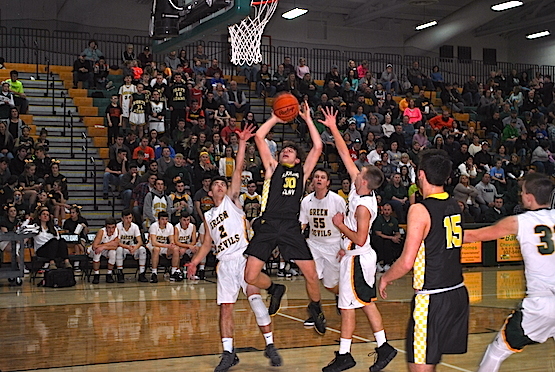 Scoring six points from the free-throw line alone, three by Rothwell, two by Cameron Young and one by Hesler, the Green Devils continued to lengthen their lead. Hesler added five more points to his total in the fourth and Elijah Young added another two points to his total of six. The Mustangs’ offense scored the most points on the night for them in the fourth quarter with 13. Miller went two-for-two from behind the arc in the fourth, giving him six points for the quarter. Conner scored four more points in the fourth, bringing his total to 15. Marcelino scored another two-point basket to give him his total of four. Cumberland scored his second point on the night, shooting 50 percent from the free-throw line on the night, going two-for-four. The Mustangs tried to slow the game down in the last minute and ten seconds by fouling the Green Devils. The Green Devils shot collectively 6-for-11 from the charity stripe in the final quarter which kept them comfortably ahead of the Mustangs.